I just finished building the Stern acceptance rate prediction model. I will post the admissions calculator as soon as I have time to finish learning PHP and then build that portion of the website. I’ll probably have time to work on it over Christmas break, but right now I am too busy applying for interviews for summer internships. In the mean time I will share some of the insights I got from building the model. The first thing that jumped out at me was that the acceptance rates I came up with are noticeably higher than the published acceptance rate of 15%. I believe that this is because the average candidate who applies and posts their data on GMAT Club, where I get my data, is more competitive than the average candidate. The average GMAT Club applicant to Stern has a GPA or 3.45 and GMAT of 709, which is not too far from the scores listed on the class profile for Sterns class of 2016 of 3.52 and 721. 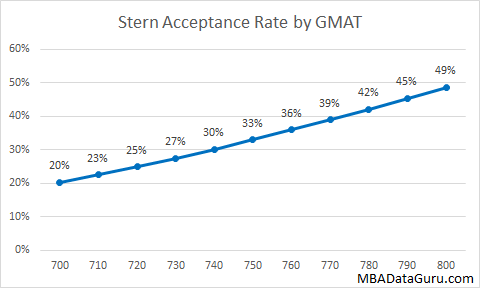 If you are applying to Stern, it is pretty obvious that having a higher GMAT is important and will significantly raise your chances of being admitted. To create the graph above, I used my model with the average GPA of 3.45. Next I looked at how GPA affects Stern acceptance rate. Once again there is a clear relationship between GPA and admission rate for NYU. In the graph below I used the average GPA score of 709 in my admissions model. Many candidates want to know if it matters in which round you apply. I took a look at the raw acceptance rate by round for NYU. As you can see the acceptance rate for round 2 is slightly lower and for round 3 it is noticeably lower. The acceptance rates above are raw numbers, not the predicted values from my admissions model. Why you ask? Because when I took into account all of the other factors, the round you apply in is not statistically significant. The reason the acceptance rate is lower in round 2 and 3 is not because the schools are more selective but because on average lower quality candidates apply in those rounds. 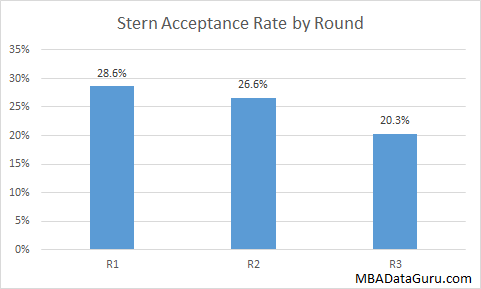 If you are a qualified candidate, do not worry about applying to Stern in round 3, you still have a good chance of getting in. In the past I tried to figure out if Stern prefers a high GMAT or GPA and didn’t come up with anything conclusive. 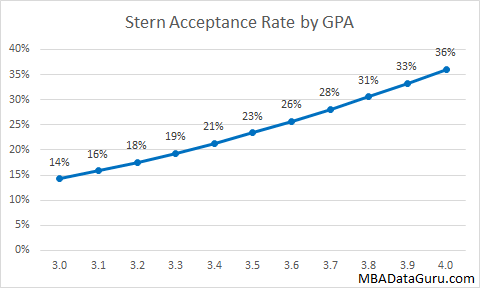 Now that I have built the Stern admissions model I can see how a similar change in GMAT or GPA impact acceptance rate at Stern. In the graph below I compare how much the admissions rate changes if I alter the GMAT or GPA by a standard deviation. If you are applying to business school then you should probably know what a standard deviation is, however if you don’t it is a standard measure of variance in a population or sample. 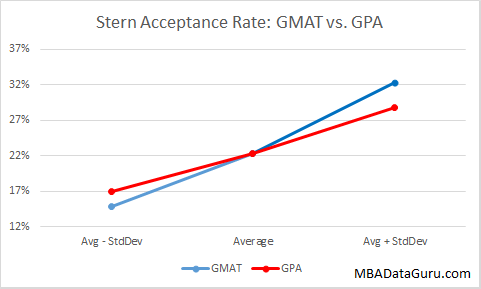 Since I can’t compare an absolute variance because GMAT and GPA are on different scales, I compare how the shift of one standard deviation impacts the Stern acceptance rate. In the graph above, you can see that increasing the GPA by one standard deviation (.28) increase acceptance rate by 29%, but raising the GMAT score by one standard deviation (39) leads to a 45% higher chance of admissions. It is clear that Stern prefers candidates with high GMAT score over ones with a high GPA. This is good news for candidates with a low GPA because with enough hard work, you can increase your odds significantly by raising your GMAT. I also found that NYU prefers candidates with an average age of 27 to 28, the further you are from this average age, the lower your chance of getting in. Stern really likes candidates that come from consulting. Applicants from consulting had a acceptance rate of 42% vs. 21% for non-consultants. Having more work experience also increased your odds of admissions. Acceptance rate increased by about 2% for each year of work experience. However, once you pass 28, the age deviation factor is significantly stronger than the work experience factor so you shouldn’t wait until after 28 to apply. I noticed that candidates that majored in business or engineering had a lower chance of admission. Business majors with average scores had a 8% chance of admission compared to 24% for non-business majors. Engineers had a 13% chance of getting in compared to a 26% chance for non-engineers. These differences are statistically significant even after taking into account all other factors. That being said, I majored in engineering and I got into Stern. I also know many other business and engineering majors who are currently attending Stern with me. This entry was posted in Admissions, GMAT, GPA, MBA, Stern and tagged Admissions, Age, GMAT, GPA, Industry, Major, MBA, Stern, Work Experience on December 7, 2014 by Data Guru. Can u come up with a similar analysis on ROSS and any European school..?? Ross is on my list of schools to analyze. I will look into European schools after I finish the top 15 in the US and see if there is enough data available. I plan to finish the top 15 over Christmas break. Harvard is almost done and should be ready in a day or two. Assuming you are a normal age for MBA applicant (26 to 29) and didn’t major in business or engineering and not a consultant, my model predicts you have a 42% chance of getting admitted. Good luck! can you please let me know my chances? GMAT 720. Gpa 3.00. Work experience 2 years. Industry – Nonprofit. Goal – to work for nonprofit consultancy. International applicant. Hello, I ran your numbers and right now your chance of acceptance at Stern is around 10%. Remember that this is just average acceptance rate and that if you have a compelling story and great execution on your application that you can raise your chances substantially. Sterns acceptance rate is 28%? I’ve read that for years its been consistently at around 16-18%… what happened? The actual acceptance rate is more like 15%, my source for the data is a skewed sample with abnormally high GMAT score which is why the average acceptance rate I came up with is 22%. Is there any skew for Indians or is NYU Stern a welcome exception to that?! I found no bias against Indian students at NYU. We have a large number of Indian student here at NYU. That’s great, thanks for letting me know! I’m an engineer with only 3 years of work experience, so I’m kind of apprehensive about applying. Odds seem to be stacked against me here! As Wayne Gretzky said, you miss 100% of the shots you don’t take. 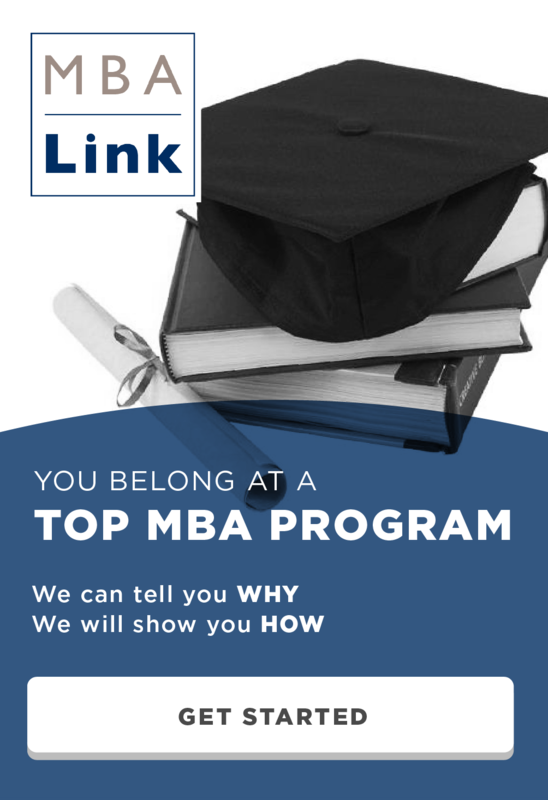 If you want to get an MBA then apply even if the odds are stacked against you. Just be sure to throw in a few safety schools. What about below 700 gmat scores? What are the odds of getting into Stern? I have a 660 GMAT, am Brazilian with 28 years old. I have 6 years of post college work experience and 2,5 year of internships during college. I have an economics degree. Could you run my numbers? Thanks a lot! Hi Pedro, I would be happy to predict your chance of admission at Stern. I need some more information, so I’ll email you directly. OK, Wayne. I’ll wait for your email then. Thanks a lot! GMAT 700, GPA 3.1, Bachelors in Engineering, Masters in Economics (one of the top schools in India), Total work ex 6 years (international – 2 yrs), Age 28, Pre MBA – consulting. What would be my chances? 700 gmat, 3.5 gap, 5 years financial services experience. Odds? what about chances in Round 4? Further, I am way above average, with 35 years. Do you think there is still a chance to get in? GMAT 710, GPA 3.9 and very strong work experience. Want to specialize in the Business Analytics track (where I have worked in the past). Hi, I would be very pleased if you could tell me if there’s any bias toward Latin American natives. Also I want to know what r my odds with a 2.7 GPA and 720 GMAT. In general it seems that Latin American applicants have a higher than average acceptance rate.